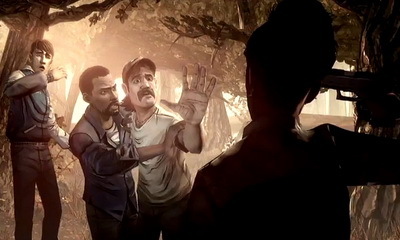 The first trailer for Tell Tale Games’ “The Walking Dead” video game was just released and… it didn’t really show that much. On the upside, the interview that followed did give us some big details on the game. 1. The game will be based on the comic book, not the TV show. 2. It will be a far more liberal adaptation on the universe than the TV show. 5. New group of survivors is a disparate group of strangers… just like in the comic. 5. Glenn will make an appearance in the first episode. 6. Main character is Lee - A convicted murderer on the way to jail when the zombie apocalypse breaks out. 7. The game will be released in episodes that get increasingly more challenging, bleak and suspenseful like an actual TV or comic series. 9. The first episode is set for release in April. The Trailer begins at the 9:00 mark.